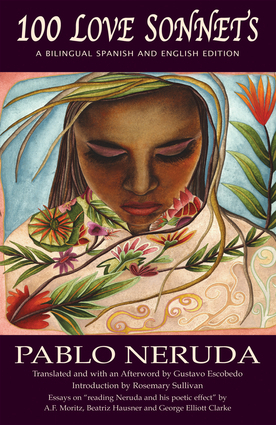 Pablo Neruda was one of the most famous poets of all time. From the 1940s on, his works reflected the political struggle of the left and the sociohistorical developments in South America. He is also very famous for his love poems, which have sold more than a million copies. Gustavo Escobedo works as a teacher, a photographer, and a translator. His other translated work is The Wolf's Mouth which won numerous prizes in its original Spanish. Rosemary Sullivan is a celebrated critic, editor, poet, and biographer. She is the author of: The Red Shoes: Margaret Atwood Starting Out (biography), Blue Panic(poetry), The Garden Master: The Poetry of Theodore Roethke (criticism), Labyrinth of Desire: Women, Passion, and Romantic Obsession (nonfiction), and editor of Oxford Book of Stories by Canadian Women in English (anthology). A. F. Moritz has worked variously as an advertising copywriter and executive, editor, publisher, and university professor. His poetry has been honored with a 1990 Guggenheim Fellowship, inclusion in the Princeton Series of Contemporary Poets, and numerous other awards. He has also written seven nonfiction books, and translated eight books into English. He currently teaches at Victoria College in the University of Toronto. Beatriz Hausner is a published poet and the translator of some 20 works of literature, principally from Spanish into English. Many of her poems were collected in The Invisible Presence Sixteen Poets of Spanish America 1925-1995 and she is the author of a full-length poetry collection, The Wardrobe Mistress. She appears frequently on CBC's Talking Books and reviews books for journals and newspapers. She is a former president of the Literary Translators' Association of Canada, and was one of the founders of the Banff International Literary Translation Centre. George Elliott Clarke's many honors include the Portia White Prize for Artistic Achievement, Governor General's Award for Poetry, National Magazine Gold Medal for Poetry, Dr. Martin Luther King Jr. Achievement Award, Pierre Elliott Trudeau Fellowship Prize, Dartmouth Book Award for Fiction, Eric Hoffer Book Award for Poetry, appointment to the Order of Nova Scotia, appointment to the Order of Canada at the rank of officer, and eight honorary doctorates. He is a pioneering scholar of African-Canadian literature and is the E. J. Pratt Professor of Canadian Literature at the University of Toronto, having previously held posts at Duke University and McGill University. They all live in Toronto, Ontario.